This traditional Turkish dessert is called 'şekerpare' ('shek-EYR par-EH'), which means "a piece of sweetness." Try some, and you'll see why it's exactly that. These sweet, sticky and tender cookies are made from semolina, flour and powdered sugar that are baked golden brown and left to steep in sweet, lemony syrup. 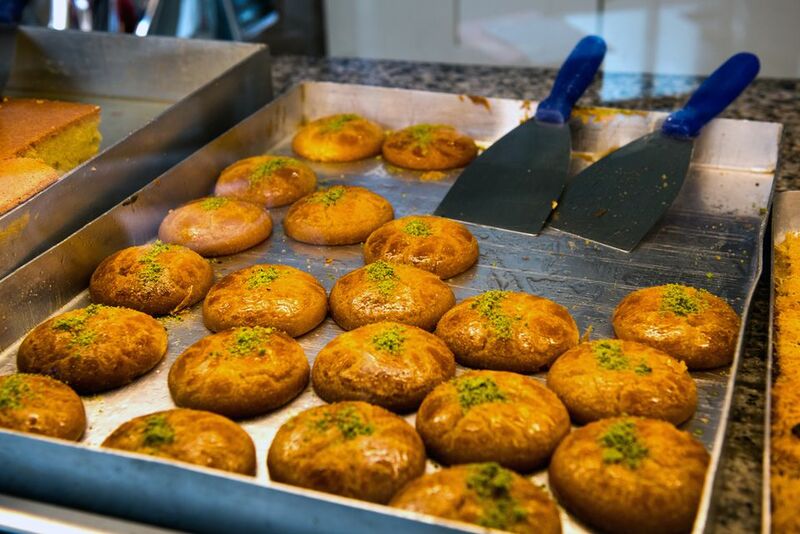 Şekerpare is made in nearly every Turkish household, sold in every Turkish bakery and sweet shop and appears on nearly every Turkish restaurant menu. It is one of the most popular Turkish sweets after baklava. Blending the ingredients and kneading the dough slowly by hand is the key to making the perfect, uniform şekerpare dough that won't crack or separate as it bakes. Each 'pare' or piece, should keep its perfect shape, even after soaking in syrup. The more syrup they soak up, the better. They should be tender enough to cut and eat with a fork. Pass up the baklava for once and try this classic Turkish dessert to satisfy your next craving for super-sweet treats. Try a piece or two with your next cup of coffee or espresso. Of course, it goes perfectly with a cup of Turkish coffee, too. First, place the softened butter or margarine in a large mixing bowl and whip with an electric mixer on the lowest setting until creamy. Add the flour. Wearing rubber gloves, work the flour into the butter with your fingers until combined. Add the powdered sugar, vanilla, baking powder, and semolina and continue working them in with your fingers until the dough has a smooth consistency. The warmth from your hands will help melt the butter and soften the mixture as you work. In the meantime, start the syrup. Add 4 cups of boiling water to a saucepan. Add the granulated sugar and the half lemon. Bring to a boil then gently simmer uncovered for about 10 minutes, stirring occasionally. Remove from the heat and let it cool down just a bit. Next, add the eggs to the dough mixture and knead them into the dough until smooth. With your hands, pinch off a piece of dough and roll it into a ball about the size of an apricot. Place it on an ungreased metal oven tray. Continue making even-sized balls and lining them up side by side, leaving some space in between. Gently press down on the top of each ball to flatten it slightly. Press an almond or a hazelnut into the center of each. Bake in a 160C or 320F oven for 20 to 25 minutes until the tops of your cookies are golden brown. Remove your tray from the oven and, while it is still hot, pour the warm syrup evenly over the top. Let the tray cool down to room temperature. As they cool, the cookies will absorb the syrup and get soft. When the şekerpare are cool, they are ready to serve. Serve two or three on a decorative plate and garnish them with a spoonful of Turkish clotted cream, called "kaymak" if you wish. Have You Tried Turkish Chocolate-Covered Chestnut Candy?